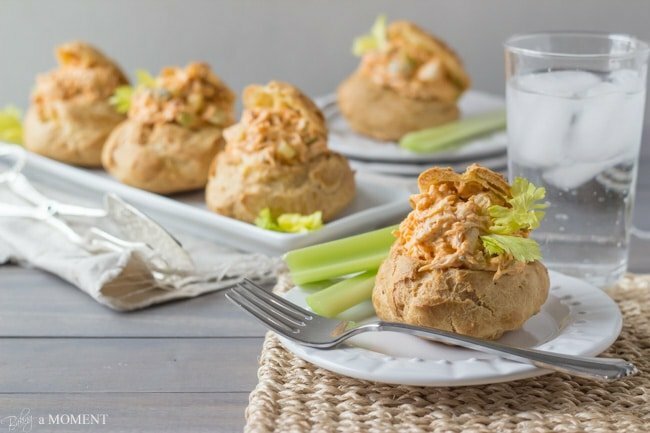 Chunky Chicken Salad Spiked with Spicy Hot Sauce, Crisp Celery, and Tangy Blue Cheese, and Stuffed into Puffy Blue Cheese Choux Pastry Puffs. 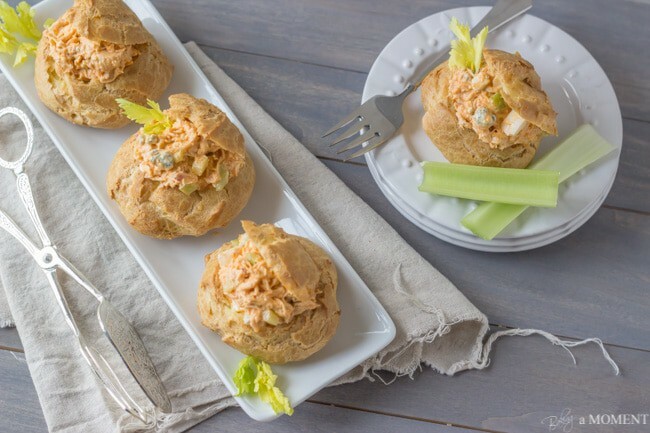 These Gougeres Filled with Buffalo Chicken Salad make Perfect Party Food! 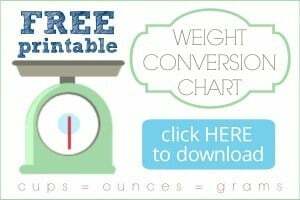 I’m sharing something a little different today! I am a huge fan of anything “Buffalo,” and if you’ve been clicking over to this page much in the last week or so, you know that I also love pate a choux puffs. First I made these, and then these. 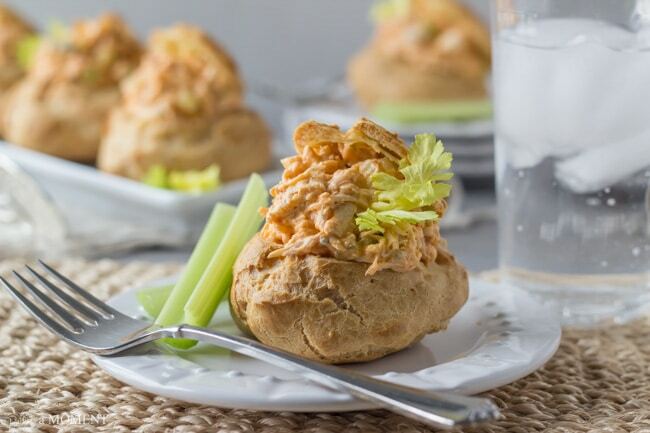 And now I’m showing you just how versatile choux can be, with this spicy cheesy creation! We ate these for a quick dinner last night, before heading over to the fields for my kids’ first little league practice of the season. But I’m imagining they’d make a great nibble for a party! A fun, slider-sized appetizer or hors d’oeuvre, or buffet offering for a birthday luncheon or baby shower. The chicken salad is chock full of crisp celery, sweet red onion, and chopped egg. The dressing is lightened up a bit with the addition of Greek yogurt. It gives a nice tangy flavor, and along with the chunks of blue cheese, really cools down the heat of the spicy buffalo dressing. Poach the chicken breasts in simmering salted water for about 15 minutes, or until cooked through. Shred or chop the chicken into small pieces. Place the chicken in a large bowl with all the remaining chicken salad ingredients, and toss well to coat. Place the water, butter, cheese, and salt in a saucepan. Heat over a medium-high flame, until the butter is completely melted and the mixture is simmering. Add in the flour all at once, and continue to cook, stirring, for about 5 minutes, or until a film begins to form on the bottom of the pot. Drop in the eggs, one at a time. Allow each egg to become fully incorporated, before adding the next (about 30 seconds to a minute). Pipe or spoon the dough into 2-inch diamer mounds, onto parchment-lined baking sheets, allowing about 3 inches in between each puff. Bake for approximately 30 minutes, or until puffed, golden brown, hollow, dry, and light. 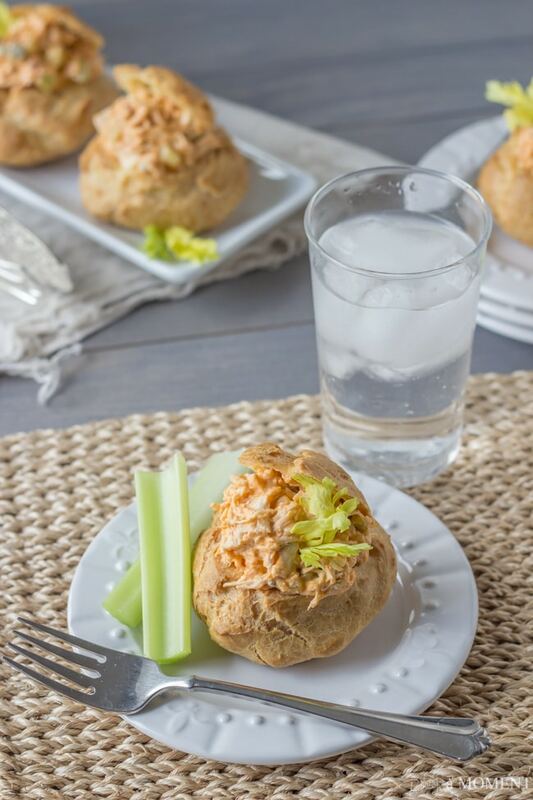 Cool the gougeres completely and fill with Buffalo Chicken Salad. As they puff up in the oven, they also hollow out on the inside. 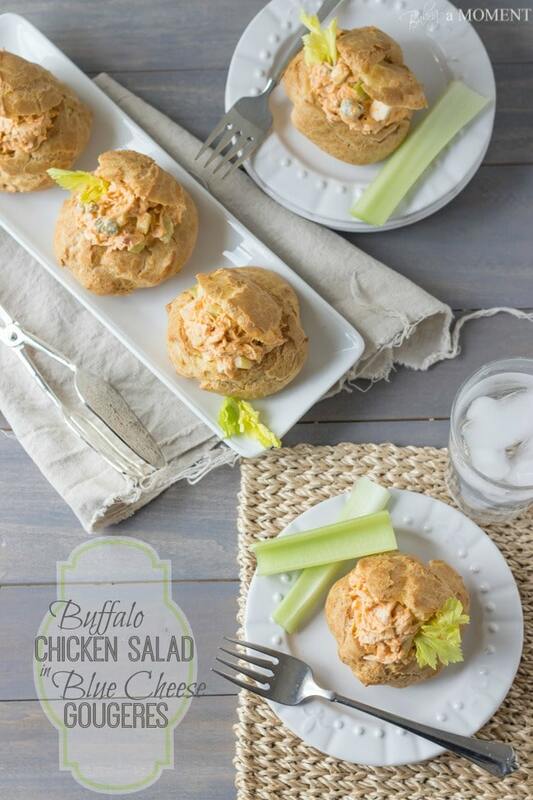 Slice off their tippy tops and find a little well that’s just begging to be filled with spicy buffalo chicken salad! I hope you guys enjoyed my little side trip into the savory world today! Few things can draw my eye away from sugary, buttery treats, but I just can’t resist buffalo + blue cheese! Such gorgeous appetizers! I’ve just been loving all your pastry recipes lately. The combination of FLAVORS in these pastries—oh my gosh. So tempting! Allie, I am loving your savory side :). All of these flavors are making me wish I could come over to your house for dinner, lol. You definitely make this look so easy – I am so intrigued to give it a try! Aw thanks, Kathi! I hope you do, choux is so versatile, it really lets your creativity shine! Thanks so much for the sweet comment, and I hope you have a great weekend! Serious yum!!! These look so perfect and this is so unique! I love it! Allie, I love this spin on chicken salad, especially since gougeres are involved. 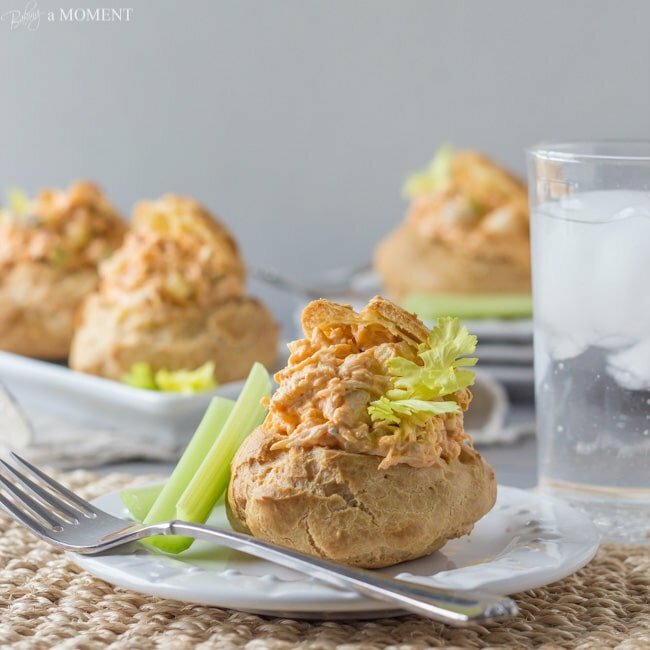 These look beautiful and my buffalo chicken loving husband will adore these! What a great idea! 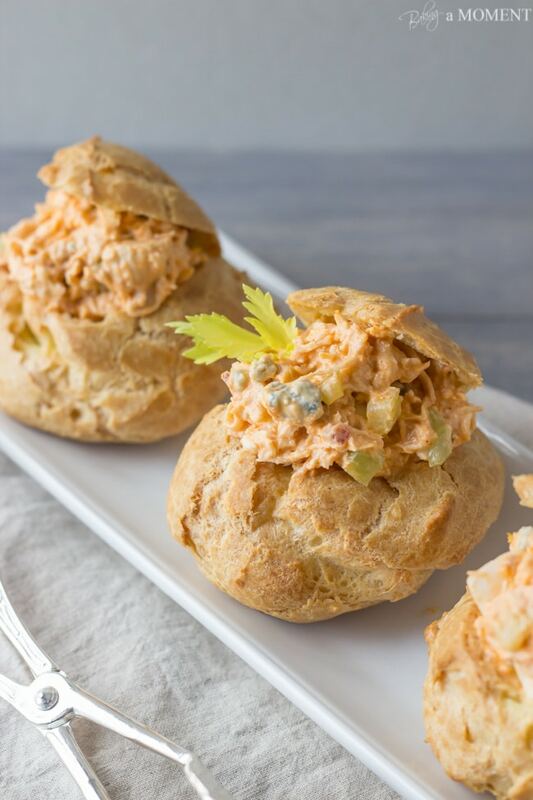 I love the “high-low” angle here with the fancy gougeres and the familiar buffalo chicken salad. You should post more savory recipes once in awhile. I love them! Thank you Nora! I’m so happy you appreciated the ‘high-low” aspect 😉 I was just dipping my toe into the water to see how well received a savory recipe would be here. I would like to do more! Thanks for the great feedback, and hope you have a great weekend, dear! The second I saw “buffalo chicken” in the name of this post I knew I had to come see it and you did not disappoint, Allie! These look absolutely amazing and I need some in my life hah I love the savory touches to this, especially the red onion, yummo! Love it! I love the idea of buffalo chicken salad. Clever! Buffalo chicken is always something my whole family can agree on. Great recipe! Pinned! I definitely wouldn’t be able to resist popping these in my mouth straight out of the oven, Allie! But a chef needs to taste what they’re cooking, right? First rule of baking! LOVE all the fresh, light flavours in these. Lemon, Greek yoghurt, blue cheese, celery, eggs … fantastic combination! The gougeres remind me of ‘Yorkshire puddings’ that we eat with roast beef and veggies in the UK! Pinning these for future reference! I have never had gougeres. In fact, I have never even heard of them.. I just did a quick google search, and oh my goodness, how I want to try to make them! This looks so good!! Can’t stand how good these look! I bet they’re amazing Allie! Allie, I’ve been loving your pastry recipes. You just amaze me. This recipe is divine! Now, I feel the need to plan a girls luncheon JUST so I can make and share this! Wow, what an incredible appetizer! I must admit, I love cream puffs filled with savory ingredients even more than sweet! And I’ve made blue cheese gougeres, too…fabulous!!! I’m kind of in love with this Allie. You may not know this but I have a serious weakness for blue cheese. I need to make this soon! Pinned! OMG Allie, those are gorgeous! They would be quite impressive at a super bowl party. 🙂 Awesome recipe!! Allie, WOW, these sound absolutely fabulous and look AHmazing. LOVE! Thank you so much for sharing your recipe at Best of the Weekend – pinning, of course, and sharing this week. Hope you have a happy Sunday and a fabulous week!